The season of resolutions and change have officially come. 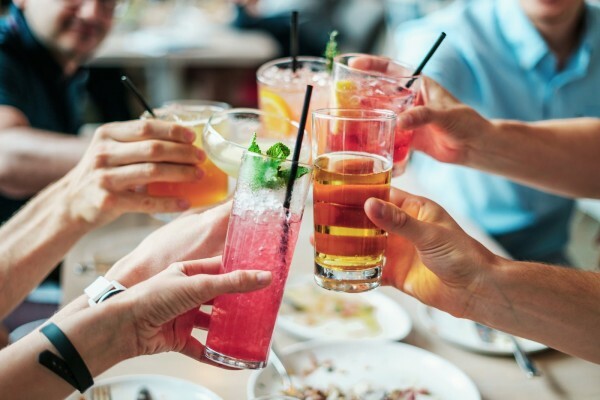 In the new year, why not change up your typical resolution of eating healthy or exercising more and instead resolve to shy away from your standard drink order and try out some funky, popular beverages from around the US? Lucky for you, Hangover Heaven has already put together a list of 2018’s most popular trendy drinks in America using Google Trends data, so all you have to do is get out and try them. If you haven’t heard of the superheroes over at Hangover Heaven, they operate a traveling bus that cures people’s hangovers around Las Vegas (so it’s fair to say they know a thing or two about what people love to drink). Without further ado, here is your guide on what to order (and where) to shake up your drink order in 2019. Mead took the cake (or the bottle) for the top trendy drink of 2018 in the above-listed thirteen states. If you haven’t heard of the honey-based alcoholic beverage, it is best described by its alias, honey-wine. Ironically, this hipster-adored drink is one of the oldest forms of alcohol dating back to 9000 BC (but you may not want to whip out that fact at the bar). The people of the states listed above went with more of a kick in 2018, with their top drink of choice being a classic Moscow Mule. This spicy, tangy, minty beverage is properly served in a copper mug, which is iconic to the drink. These seven states went spicy this past year, in more ways than one. With the most popular drink being the jalapeño margarita, the residents of these states not only showed their appreciation for the spicy jalapeño pepper, but also for tequila, which can spice up any situation. One of the newest types of drinks on the market, hard seltzers dominated the social scene in these six states, who found the best way to get a little tipsy can be as simple (and refreshing) as grabbing a can of flavored sparkling water. Growing up, a favorite summer treat is a cold popsicle, but why should it be restricted to kids? 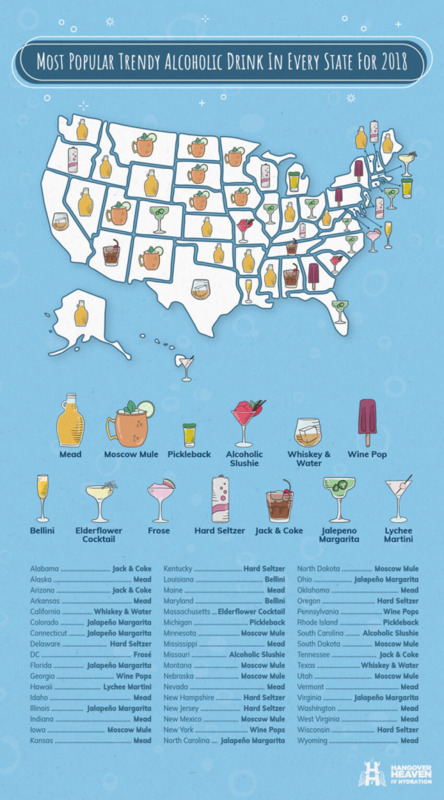 Just add some booze and you have wine pops, which came out as the hottest (or in this case coldest) trendy drink in these three states. It shouldn’t come as a surprise that this combination came out on top in Tennessee, the birthplace of the Jack Daniels brand. Arizona and Alabama were also big fans of the mix, with it being the top drink of choice in these two states as well. A classic combination, whiskey and water was the most popular trendy drink of 2018 in California and Texas. If you happen to wander into a bar in either of these two states, your order should be simple enough. If you can’t think of a more repulsive combination than pickles and whiskey, then you probably aren’t from one of the two above states where the Pickleback shot was the most popular drink in 2018. For anyone who hasn’t heard of the novelty, it’s a shot of whiskey followed by a shot of pickle brine or, in some cases, a bite of pickle. What's your drink of choice this year?